The book is a work of art, and if Baz Luhrmann’s track record is anything to go by, the film starring Leonardo Di Caprio is likely to be just as sumptuous a visual feast as this era of jazz, flappers and bootleggers deserves. To celebrate the occasion, a rare UK first edition of The Great Gatsby is currently available from Vintageseekers.com. Published in 1926 by Chatto and Windus, the book is apparently in good condition with only minor handling marks and some light signs of wear. It’s certainly not cheap at £950, but owning that book would be akin to possessing a sparkling slice of history. In May 2011 I visited Tunisia and found a country still reeling from its revolution. It’s a complex place, Tunisia – a country where the locals describe themselves as Mediterranean, yet the main religion is Muslim, and as many farmers keep camels as sheep. 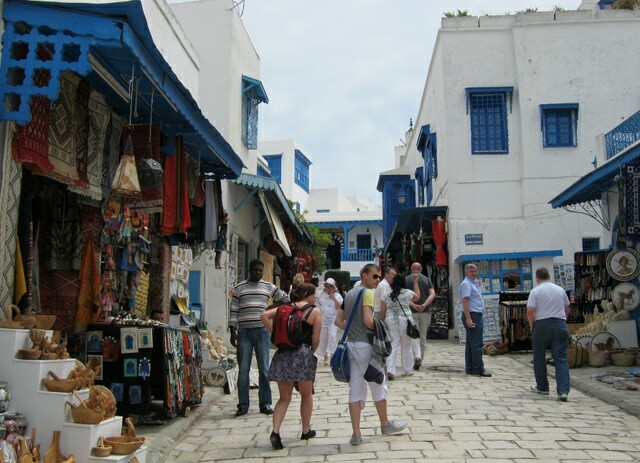 Tourism has overtaken agriculture as the main earner in recent years, transforming many coastal areas, particularly those in popular Hammamet, into spa and bar hotspots that could almost be anywhere on the Med, if it wasn’t for the elegant curling Tunisian script adorning street signs and shop fronts. There’s something magical about entering a museum after nightfall – the usual exhibits take on shadowy countenances and it really feels like anything could happen. If you’ve never experienced this for yourself, take advantage of the annual Museums at Night late night festival of art, culture and heritage. This year it will take place over three nights from Thursday 16 till Saturday 18 May. The Bardsey Island of Twenty Thousand Saints is as rich, bizarre and wonderful as any fictional land. Each time you pick the novel up, you’ll find yourself eagerly anticipating an absolute sense of transportation, as Fflur draws you into the world of Bardsey until you feel you’ve walked those mountain paths, felt that sunshine on your skin, tasted the salt on that breeze. It’s so vividly portrayed that it seems impossible this place actually exists in the real world, yet it does, and Flur’s ability to evoke it so powerfully stems from six weeks as the island’s writer in residence, making us wonder how much of her there is in the character of Mererid, the poet in residence. Moved to write something a bit out of the ordinary? Minor Arcana Press is currently welcoming submissions of poems related to superheroes and superhero mythology for a new anthology titled Drawn to Marvel, which will be edited by Bryan D. Dietrich and Marta Ferguson. The deadline for submissions is Wednesday 15 May 2013.